If you do a lot of SMD soldering, a reflow oven is the fastest and most efficient way to get all those tiny components attached to your PCB. [Frank Zhao] saw the reflow ovens we featured here over the last few weeks and figured he might as well show off his rig as well. We’re certainly glad he did, because his very thorough writeup is a great stepping stone for anyone looking to construct a reflow oven of their own. Like many others, he started off with a used toaster oven, modifying it to be controlled directly via the power cable rather than the oven’s dials. He built a small PCB to regulate the oven, which features an ATmega32u4 and thermocouple to keep the temperature in check. Control of the heating element is done using a solid state relay, for which he built his own heatsink. He studied the reflow profile of the solder he would be using, programming the microcontroller to regulate the heating/cooling process without requiring any user input, aside from turning the oven on. Check out the video below to see a brief overview of his system, and be sure to swing by his writeup to take a look at all the build details. There are a handful of additional videos along with plenty of pictures there, walking through each step of the process. 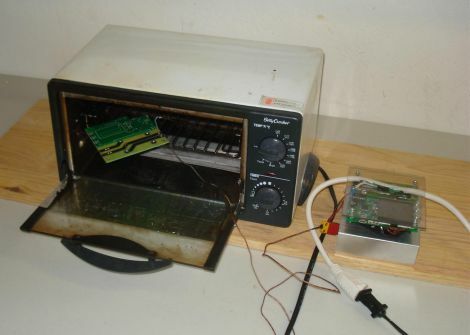 I did a similar project with a small 900W toaster oven like the one pictured, and a Forebrain microcontroller board. For me it turns out that the oven at full power (without switching) produces a ramp that you could call “close enough” to the required reflow profile that in reality you could just take an unmodified toaster oven, put your electronics in, and just set a timer. These days, I don’t even bother turning the microcontroller segment on, I just put my electronics in the oven, set it to max power, and then watch the solder liquify, wait for 20 seconds, and then turn the power off and leave the door ajar. @Meseta I’m with you. For small boards, I just eyeball it. I did, however, put two marks on the temp dial (for soak and peak). Past that, I don’t need any automation. What I’d like to see is a DE-soldering Oven where you can heat it up enough for all the components to fall out if the board is upside down. Would this work that way too?? Charlie — It would melt the solder, and that would make any SMD components drop off. However, I think you are much better off with a simple heat gun for that purpose. They’re cheap and easy to use. Just FYI, this won’t work by it self. At least not with the smaller components. The surface tension of the solder is usually enough to keep most surface mount components stuck. However, a good hard knock on the back of the board while the solder is liquid with a pliers should be enough to get most of them off. Here is another <a href="Reflow Oven with an MSP430 along with reflow profiling. It is more complicated but you can adapt it to your needs.